A classic bike bash offering that unique experience and a short ferry crossing makes this a must for any enthusiasts bucket list. The scene of Grand Prix racing in the 1950s Caen in Northern France celebrates its past at the end of June every year with a ‘Retrofestival’. On the Sunday barriers and straw bales mark out parts of the old circuit with areas of the town closed to traffic, the streets come alive with the sound of some very rare revving engines. Officially, demonstrations are supposed to be a sedate affair, in reality the venue turns into a ‘street track day’ for any pre-85 machines to enjoy; saying that, the event is well marshalled and safety remains the main priority. At least 4 sessions of fifteen minutes are guaranteed for each entry costing just a few Euros should you feel inclined to join in; classes from the earliest cycle cars, bikes, side cars and four wheeled machines are separated from their more modern counterparts. The track is no more than a mile in total and with chicanes and hairpin turns it is quite technical but ensures the speeds are controlled and the spectators get to enjoy the action really close up. By the afternoon the enthusiastic crowd are four deep and cheer on the participants with a very excitable commentary adding to the atmosphere. 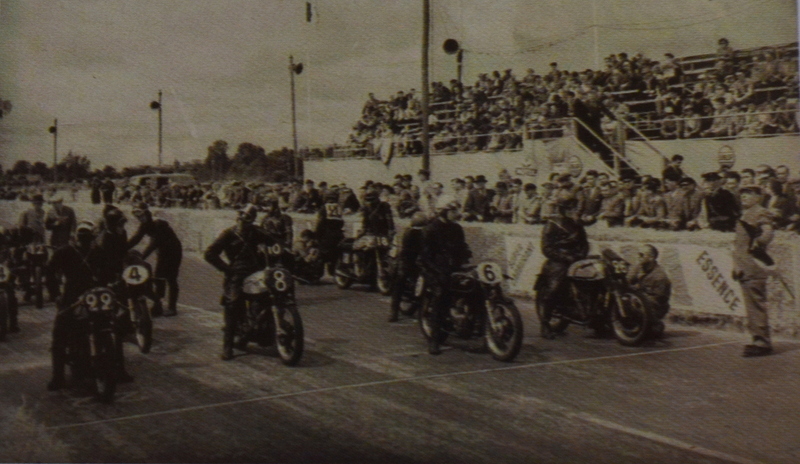 Stirling Moss was the last GP driver to win here in 1958 on the Circuit de la Prairie but bikes were always included in the event and featured mainly European stars of the time. Norton enjoyed several victories here in the 500cc class with the smaller machines featuring entries from Peugeot, Terrot and Morini; most still represented in 2015. In fact from pre-war to the late 80s some of the rarest from every decade ‘gave it their all’ including the sidecars which are a real favourite of the locals. 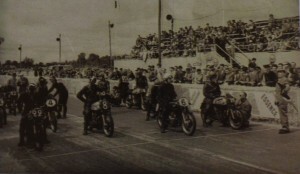 The bike paddock is inside the adjacent horse racing track as it was 65 years ago; known as the Hippodrome this is the venue for most of the weekend’s festivities with stalls, bars and food. Due to the location I took the overnight Brittany Ferry from and back to Portsmouth and caught a 15 minute bus ride into town; a cheap crossing and just 10 Euros entry meant a day to remember for well under £100. There are several such events throughout Northern France each year but this one had so much to offer and the organisers would love to include some UK entries in their programme for next year. My French is no better than Del-boy Trotters but the universal language of classic machines conquers all and the local owners are desperate to share their bikes details with visitors; bonjour and tres bon is really all you need. Where else could you enjoy forgotten marques such as Monet Goyon and Nimbus being ridden with vigour, chased by wartime Harley’s and a BMW sidecar out-fit; well you can in Caen.